Type: BOOKS. Detail: Bernal, L. Product Code: 9789056917401. Category: OPENINGS KPR. Publisher: . Club players often hesitate to include 'the Berlin' in their repertoire because they see the typical Berlin Wall endgame as complex and daunting. International Master Luis Bernal has unraveled the Berlin and made it accessible for amateur players. 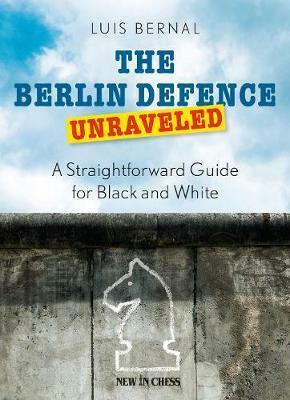 His practical guide is fully up to date, explains typical formations and strategies, and presents new ideas and resources in the old Berlin Wall structures. But today, the Berlin is much more than just the Wall. Bernal systematically leads you through the labyrinth of the various modern Anti Berlins with their constant flow of new ideas. He also presents a number of tricky sidelines that could catch your opponent off guard. This nono nonsense, state of the art guide finally brings this important chess opening within reach of club players. With clear explanations, concise conclusions and didactic exercises. Softback 272 pages. Anti-Spanish Cozio Defence. Dreev, A. $39.95.